User interfaces present one of the most interesting quandaries of modern computing: we’ve moved from big monitors and keyboards to touchscreens, but now we’re heading into a world of connected everyday objects and wearable computing — how will we interact with those? Metaio, the German augmented reality outfit, has an idea. Augmented reality (AR) involves overlaying virtual imagery and information on top of the real world — you may be familiar with the concept of viewing a magazine page through your phone’s camera and seeing a static ad come to life. Metaio has come up with a way of creating a user interface on pretty much any surface, by combining traditional camera-driven AR with thermal imaging. Metaio has a bunch of fascinating use cases to hand: security keypads that only the user can see; newspaper ads with clickable links; interactive car manuals that show you what you need to know about a component when you touch it. But right now this is just R&D – nobody is putting thermal imaging cameras into their smartphones and wearables just yet, and Lord reckons it will take at least 5 years before this sort of thing comes to market, if it ever does. Researchers at the MIT Media Lab and the Max Planck Institutes have created a foldable, cuttable multi-touch sensor that works no matter how you cut it, allowing multi-touch input on nearly any surface. In traditional sensors the connectors are laid out in a grid and when one part of the grid is damaged you lose sensitivity in a wide swathe of other sensors. This system lays the sensors out like a star which means that cut parts of the sensor only effect other parts down the line. For example, you cut the corners off of a square and still get the sensor to work or even cut all the way down to the main, central connector array and, as long as there are still sensors on the surface, it will pick up input. novel physical topologies and printed forward error correction. You can read the research paper here but this looks to be very useful in the DIY hacker space as well as for flexible, wearable projects that require some sort of multi-touch input. While I can’t imagine we need shirts made of this stuff, I could see a sleeve with lots of inputs or, say, a watch with a multi-touch band. Don’t expect this to hit the next iWatch any time soon – it’s still very much in prototype stages but definitely looks quite cool. Touchscreen laptops appear to be rising in popularity as the newest data from market research firm DisplayBank says that touchscreen notebook shipments have jumped 51.8% during Q1 2013 compared to the previous quarter. A total of 4.57 million touchscreen laptops were shipped during the quarter, making up 10% of all notebook shipments during Q1 2013. Throughout the entire Q1 2013 quarter, a total of 46 million laptops were shipped, so 4.57 million touchscreen variants certainly isn’t a lot, but with a healthy increase from the previous quarter, touchscreens in laptops are becoming more popular than ever. 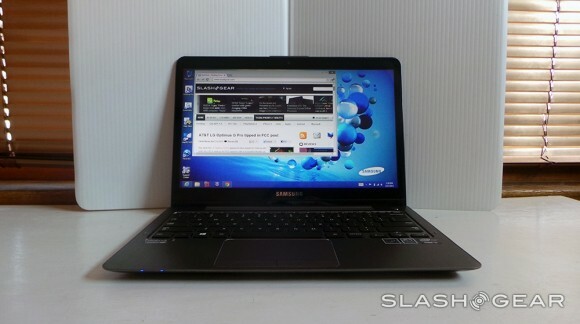 Most likely, the number of these kinds of laptops will only increase in the future. Specifically, manufacturers like Lenovo, Acer and ASUS have set higher targets for themselves to achieve over 20% of touchscreen market share, which could be quite achievable, but it’s really only up to consumers who want to adopt touchscreens in their laptops. We already know Apple thinks that people don’t want them, but a 51.8% increase says otherwise. Much of the adoption of touchscreen technology in laptops is thanks to Windows 8, which includes a touchscreen-friendly start screen that you can swipe and navigate around using your fingers. Of course, the new operating system hasn’t received a lot of compliments lately, and its adoption rate is slightly slower than what Microsoft or PC makers were expecting, but most OEMs have added touchscreen laptops to their repertoire due in part to Windows 8. 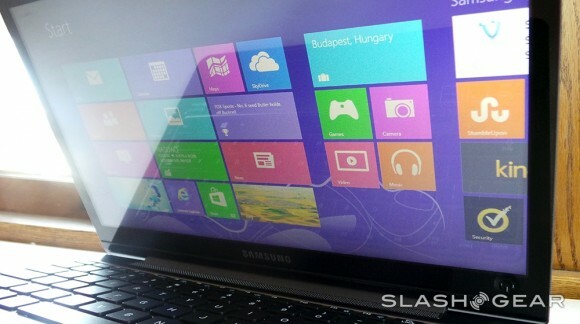 Plus, as laptop prices get lower and lower, touchscreen laptops will become more affordable. Right now they’re quite on the pricey side, with a decent machine running over $1,000, but former Intel CEO Paul Otellini says that touchscreen laptops will break the $200 barrier in the near future, so the technology could eventually become the norm. Swipe, swipe, pinch-zoom. Fifth-grader Josephine Nguyen is researching the definition of an adverb on her iPad and her fingers are flying across the screen. Her 20 classmates are hunched over their own tablets doing the same. Conspicuously absent from this modern scene of high-tech learning: a mouse. Nguyen, who is 10, said she has used one before — once — but the clunky desktop computer/monitor/keyboard/mouse setup was too much for her. Gilbert Vasquez, 6, is also baffled by the idea of an external pointing device named after a rodent. “I don’t know what that is,” he said with a shrug. Nguyen and Vasquez, who attend public schools here, are part of the first generation growing up with a computer interface that is vastly different from the one the world has gotten used to since the dawn of the personal-computer era in the 1980s. This fall, for the first time, sales of iPads are cannibalizing sales of PCs in schools, according to Charles Wolf, an analyst for the investment research firm Needham & Co. And a growing number of even more sophisticated technologies for communicating with your computer — such as the Leap Motion boxes and Sony Vaio laptops that read hand motions, as well as voice recognition services such as Apple’s Siri — are beginning to make headway in the commercial market. John Underkoffler, a former MIT researcher who was the adviser for the high-tech wizardry that Tom Cruise used in “Minority Report,” says that the transition is inevitable and that it will happen in as soon as a few years. Underkoffler, chief scientist for Oblong, a Los Angeles-based company that has created a gesture-controlled interface for computer systems, said that for decades the mouse was the primary bridge to the virtual world — and that it was not always optimal. This type of thinking is turning industrial product design on its head. Instead of focusing on a single device to access technology, innovators are expanding their horizons to gizmos that respond to body motions, the voice, fingers, eyes and even thoughts. Some devices can be accessed by multiple people at the same time. Keyboards might still be used for writing a letter, but designing, say, a landscaped garden might be more easily done with a digital pen, as would studying a map of Lisbon by hand gestures, or searching the Internet for Rihanna’s latest hits by voice. And the mouse — which many agree was a genius creation in its time — may end up as a relic in a museum. The first computer mouse, built at the Stanford Research Institute in Palo Alto, Calif., by Douglas Englebart and Bill English in 1963, was just a block of wood fashioned with two wheels. It was just one of a number of interfaces the team experimented with. There were also foot pedals, head-pointing devices and knee-mounted joysticks. But the mouse proved to be the fastest and most accurate, and with the backing of Apple founder Steve Jobs — who bundled it with shipments of Lisa, the predecessor to the Macintosh, in the 1980s — the device suddenly became a mainstream phenomenon. Englebart’s daughter, Christina, a cultural anthropologist, said that her father was able to predict many trends in technology over the years, but she said the one thing he has been surprised about is that the mouse has lasted as long as it has. She was 8 years old when her father invented the mouse. Now 57, she says she is finally seeing glimpses of the next stage of computing with the surging popularity of the iPad. These days her two children, 20 and 23, do not use a mouse anymore. San Antonio and LUCHA elementary schools in eastern San Jose, just 17 miles south of where Englebart conducted his research, provide a glimpse at the future. The schools, which share a campus, have integrated iPod Touches and iPads into the curriculum for all 700 students. The teachers all get Mac Airbooks with touch pads. “Most children here have never seen a computer mouse,” said Hannah Tenpas, 24, a kindergarten teacher at San Antonio. 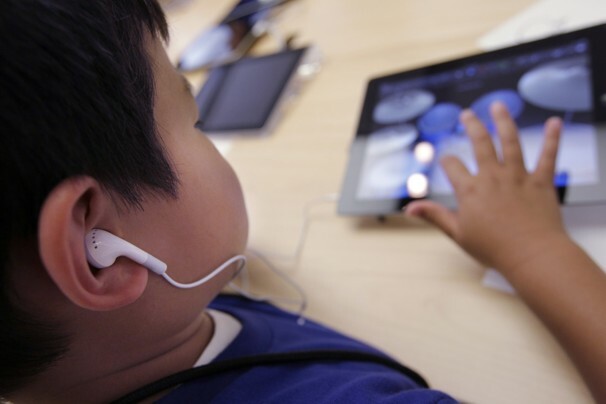 Kindergartners, as young as 4, use the iPod Touch to learn letter sounds. The older students use iPads to research historical information and prepare multimedia slide-show presentations about school rules. The intuitive touch-screen interface has allowed the school to introduce children to computers at an age that would have been impossible in the past, said San Antonio Elementary’s principal, Jason Sorich. Even toddlers are able manipulate a touch screen. A popular YouTube video shows a baby trying to swipe the pages of a fashion magazine that she assumes is a broken iPad. “For my one-year-old daughter, a magazine is an iPad that does not work. It will remain so for her whole life,” the creator of the video says in a slide at the end of the clip. Underkoffler said that while desktop computers helped activate the language and abstract-thinking parts of a child’s brain, new interfaces are helping open the spatial part. “Once our user interface can start to talk to us that way .?.?. we sort of blow the barn doors off how we learn,” he said. That may explain why iPads are becoming so popular in schools. Apple said in July that the iPad outsold the Mac 2 to 1 for the second consecutive quarter in the education market. In all, the company sold 17 million iPads in the April-to-June quarter; at the same time, mouse sales in the United States are down, some manufacturers say. “The adoption rate of iPad in education is something I’d never seen from any technology product in history,” Apple chief executive Tim Cook said in July. At San Antonio Elementary and LUCHA, which started their $300,000 iPad and iPod experiment last school year, the school board president, Esau Herrera, said he is thrilled by the results. Test scores have gone up (although officials say they cannot directly correlate that to the new technology), and the level of engagement has increased. The schools are now debating what to do with the handful of legacy desktop PCs, each with its own keyboard and mouse, and whether they should bother teaching students to move a pointer around a monitor. 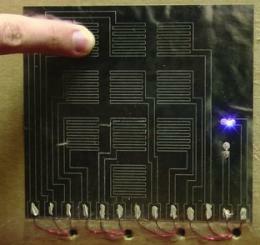 A paper-based touch pad on an alarmed cardboard box detects the change in capacitance associated with the touch of a finger to one of its buttons. The keypad requires the appropriate sequence of touches to disarm the system. Image credit: Mazzeo, et al. The touch pads are made of metallized paper, which is paper coated in aluminum and transparent polymer. The paper can function as a capacitor, and a laser can be used to cut several individual capacitors in the paper, each corresponding to a key on the touch pad. When a person touches a key, the key’s capacitance is increased. Once the keys are linked to external circuitry and a power source, the system can detect when a key is touched by detecting the increased capacitance. According to lead researcher Aaron Mazzeo of Harvard University, the next steps will be finding a power source and electronics that are cheap, flexible, and disposable. Among the applications, inexpensive touch pads could be used for security purposes. The researchers have already developed a box with an alarm and keypad that requires a code to allow authorized access. Disposable touch pads could also be useful in sterile or contaminated medical environments. What if you could feel what's on your television screen? Tech company Senseg is working on a way for you to someday be able to do just that, and recently demonstrated a prototype tablet that is already able to make that magic happen. The tech is made possible using an electrostatic-field-based system that allows different parts of the screen to produce varying degrees of friction. 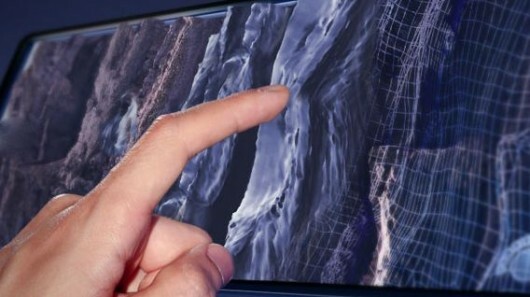 So, while you're touching a flat screen, it feels like you're touching something textured instead. Your traditional screen is turned into what Senseg is calling a "Feel Screen," allowing you to feel textures, contours and edges of things that are displayed in front of you. Feel Screens don't rely on moving parts in the screen itself, and could be integrated into devices we use today such as smartphones, tablets, and televisions. Senseg's technology is still very much in prototype-form, but could be headed our way in the next 24 months.